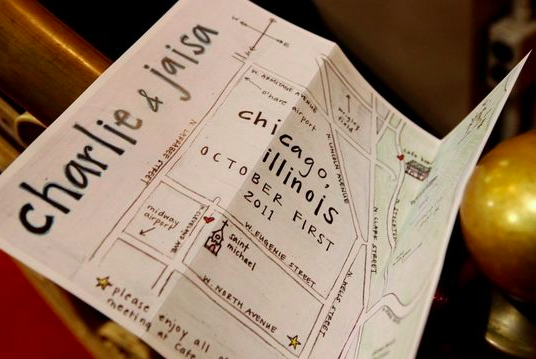 When Jaisa & Charlie asked me to make a map for guests for their wedding day, I was a little nervous. They wanted something that would direct guests from the church to their wedding reception but was a bit more artsy than a Google Maps printout. This would be handed to guests along with the programs from their beautiful stationer so, you know, no pressure. To start, I tracked down some tracing paper and traced a map of their wedding area that I had printed from the internet. I traced the major streets and made a bunch of copies of the tracing paper to start practicing on. 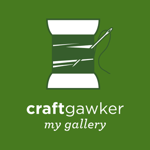 It was a lot easier than I would have imagined… give it a shot for your own wedding and stay homey! 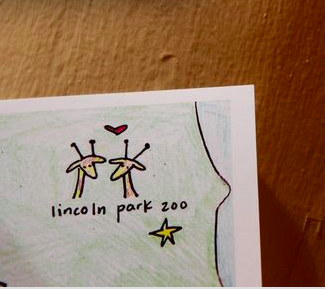 I love Chicago.....and your drawing of the cute giraffe's!!! I've been to a few weddings at St. Michaels....BEAUTIFUL church!! what an amazing map. I love it!!!! And I love that it is more personal..... shoot now I just wish I had a reason to make a map..... it might just be kind of cute wall art of a special place..... hummmm now you have me thinking!